If you or someone you know likes Cajun cooking and peanuts, this is the gift to give. It's also a great snack for parties or when watching TV sports events. Vacuum-sealed in 18 oz. tin for freshness. The Cajun peanuts are always a favorite in my house. I'm always pleased with the shipping and website! I ordered these Smoked Cajun Virginia Peanuts for the first time and they are my new favorite peanuts! They are spicy and delicious! If you like a spicy peanut, these are for you! Came on time as promised, so many companies fail in this area. The smoked cajun peanuts are great if you like spicy flavors. 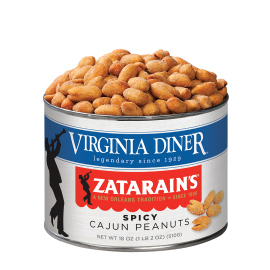 I really like these Cajun Nuts from the can or sometimes place some in frig.... they're good cold too. I have always had nothing but great products from VD and wonderful costumer service! I enjoyed the buying experience from Virginia Diner! The web site was easy to use. The peanuts were delivered before Christmas. They taste Great! I plant to order again. 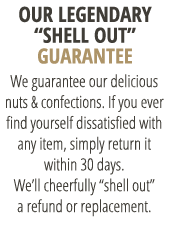 I first ordered these peanuts on Amazon, then could not find them on the site. I loved them so much, I ordered them directly from Virginia Diner and will definitely do so again. They make a wonderful gift, also.